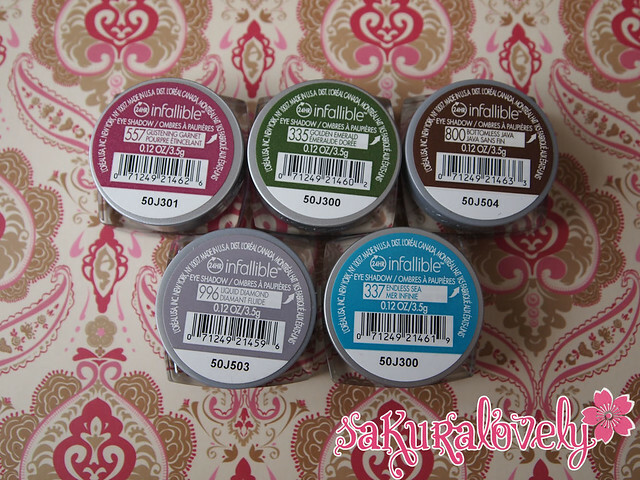 L’Oreal Color Infallible Eyeshadows: American Summer 2012 Edition | sakura, lovely. Long time no see, everybody! Mostly it’s been that I have been very busy with work this summer (the sad thing about my job is that while I can leave work at work, they can also call me in, and I usually feel guilty enough that I go) so while I’ve been receiving packages in the mail I haven’t had time to play with anything (lately I’ve prioritized sleep > makeup). But I was so excited to FINALLY get these that the minute I had a sunny day AND a day off I was photographing and watching. Still testing the wear time out on these but I thought I’d post swatches. 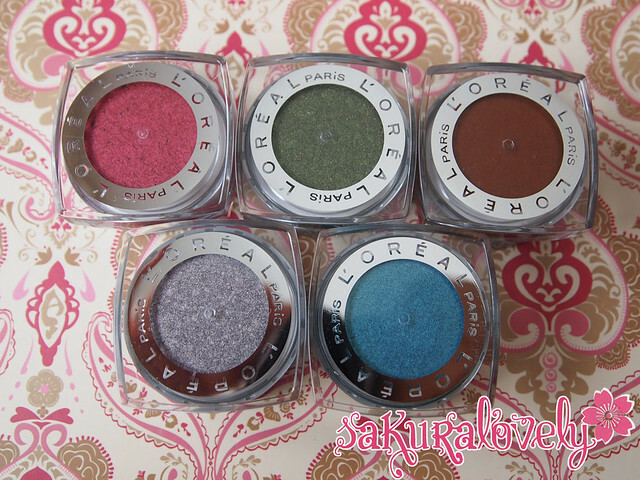 You know by now that I love and collect these shadows and their various counterparts like Pokemon, but in case you are unfamiliar with them, the L’Oreal Color Infallible Eyeshadows are a loosely pressed powder eyeshadow that come in a variety of finishes (generally metallic, though there are matte colours in both the American/worldwide releases). The initial line was 9-12 eyeshadows but they’ve since expanded to include over 36 colours (however some are very VERY similar and some are dead-on duplicates). What I noticed about this particular release is that the texture was far more crumbly than previous – it might have been the heat, but several of the eyeshadows were stuck to the little lid insert when I got them and lifted straight out of the pot – be careful! They crumble fast so while I simply re-pressed them in, it was a pain in the bum to have to do so for all 5 of these -.-; And it got messy! This is your reminder NOT to throw the plastic insert out. 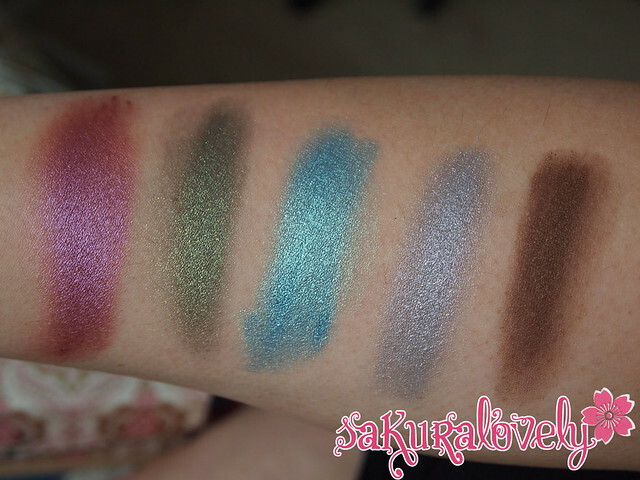 These aren’t as multi-dimensional as the shades from the Miss Candy/L’Or Electric collection in the pot BUT I found them more jewel-toned and less pastel, so I think they were aiming for two very different looks! 557 Glistening Garnet: a dark, shimmery pink, my favourite colour from this release. This colour is brand new. 996 Liquid Diamond: Bright silver. On me, this is exactly the same as 015 Flashback Silver. The last shade in this ‘collection’ is Smoldering Plum which I believe is a dupe of 013 Burning Black. I’ll update this post when I have it in my hands to confirm. Hope the swatches were helpful! If you don’t have a true silver yet, it’s gorgeous! I’m glad that most of the collection are dupes, that way I won’t have to find yet another container to put these in. I hope Smouldering Plum is really Burning Black, it looked kinda different in Labbit’s swatches but could just be lighting. I know I need to give the exact duplicates away… already running out of space again. Ah well! Smoldering plum looks the same as Burning Black on Iris! Glistening garnet is beautiful! Right now I am looking for a wine color to add to my collection. I love glistening garnet – it’s definitely the standout for me! It won’t help if my response is ‘all of them if they are on sale’, right? agree that bottomless java looks like a dupe for endless chocolate! Liquid diamond looks pretty close to fashback silver to me but not sure whether it will be a dupe on me. Liquid Diamond and FLashback silver were identical on me! Smoldering Plum is the same shade as Burning Black. I bought Burning Black, and took it with me to the store. Opened both colors and it was obvious they were the same with different names and numbers. Very annoying actually that L’Oreal does this. I could of saved a lot of money paying a lot more to acquire colors from other countries. Oh well, that’s why I’m glad you and others make posts like this. So….thank you! I have the exact same feeling! Oh well. At least the product is nice!